We are pleased to announce our second publication of 2018 - Thónia - the End of the World. Continuing our Venârivè Almanac series, this module describes the most remote, isolated and mountainous region of all of Lýthia - the veritable 'End of the World'. Thónia is also the 'end of the world' in another sense - it suffered dramatically from the effects of the Red Death, to the extent that all the civilised states in the region collapsed, and have yet to recover. 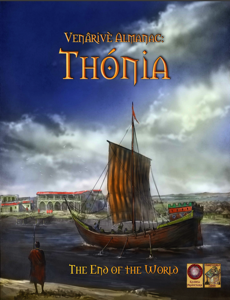 Thónia is thus a region of wild peoples, who nevertheless have an ancient and storied past. They struggle under pressure from the natural environment, and the impact of slaving and competition from new Faláni colonies.